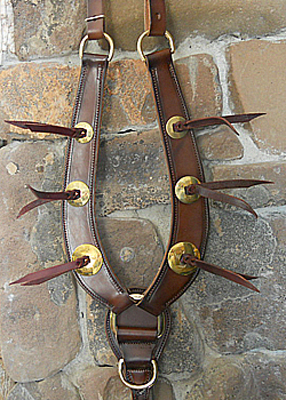 This breast plate shown in brown leather with brass conchos and a tie down dee. 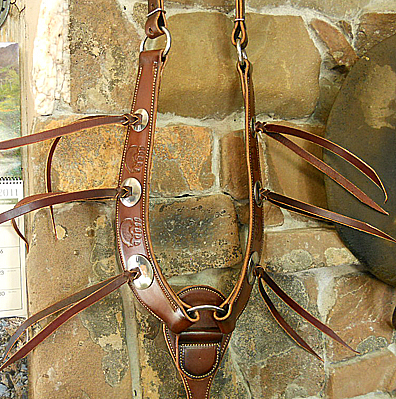 This breast plate shown in russet leather with stainless conchos and tooled bear paws. Please inquire for hand-tooled designs. Breast collar with bling! choose either brass or stainless conchos and hardware for your breast plate, color choices russet light oil, brown, chestnut or black USA leather. Our Sharp breast collars are built to last! $175.